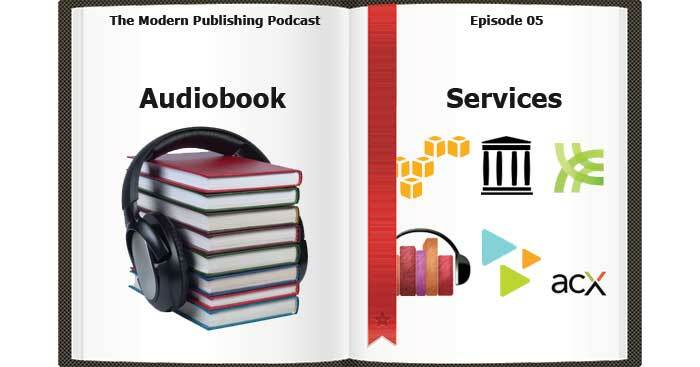 Welcome to the 5th episode of the Modern Publishing Podcast. You may have noticed that there has been a little bit of a break the last couple of weeks, and I apologize for that. I didn’t think that everybody wanted to listen to me coughing up alone while I was trying to record, and one of the disadvantages of having a small child in daycare is sometimes the germs come home with them. So I apologize for that. I’m going to try and get an episode recorded and just available for the next time that might happen. But today I’m going to continue on where I left off with Episode 4. The last couple of episodes we’ve talked about where you can distribute the print versions of your book as well as where you can distribute e-book versions of your book. So today I want to go on to the next phase which is distributing audiobook versions. Now, there’s a lot more that goes into creating an audiobook than into a print or a digital book. When you’re doing print, you have to get everything typeset. When you’re doing a digital book, then you need to do the conversion process. But both of those are relatively easy and don’t have to be very time consuming, especially once you get some processes down. When it comes to putting together an audiobook, however, then it’s a little bit more time intensive because there’s no way to have less time than how long the audiobook is going to be. On average, you’re looking at about 9,200 to 9,800 words per hour for the average person, so if you have 40,000- or 50,000- or 80,000-word book, then it’s going to be quite long. So you’re going to have not just the time that it takes to record it, but also the time it takes to edit it which depending on how good you are, that is going to take anywhere from a minimum of three hours and as many as seven or eight hours per final hour of audio. So as you can tell, this is going to be quite an undertaking. Now, it’s pretty easy to find people that you can outsource this to, and you can hire people to do the production for you, but be aware that that’s going to cost quite a bit of money because it’s not a simple process, and if you want to do it right, then there’s an investment and not just the training and in the time to do it, but also in the equipment needed to be able to do it effectively. There are a couple of ways that you can do it cost effectively, but that’s going to depend on how you plan to distribute it and what you plan on doing with your book. So if creating an audiobook is going to be so difficult or so expensive, then why would you want to? And to sum up the answer to that is a statistic that I heard in a workshop that I went to recently that was put on by Rich Brooks, and one of the presenters there had mentioned that there are currently more smartphones in the world than there are people that own toothbrushes. So in other words, people have these amazing devices, these computers that can literally fit into your pocket and there are more of those in the world than there are people brushing their teeth. Now, the reason that that’s important is because if you have a smartphone, then you have access to listening to podcast such as this one. You have access to audiobooks. It’s extremely easy to get those set up on whether you have an iPhone or an Android or whatever device you have, then it’s so easy to connect your device up to these different forms of audio content, especially with all of the different marketplaces that are in place to just make it completely seamless that it’s getting very popular and it’s only becoming more popular as time goes on. So having a place where you can get in and make a huge impact on someone and build a very good relationship by having your words directly in their ear buds for an hour, two-hour, however long at a time that they’re listening can be very powerful. So one of the things that you want to consider is how can you do it cost effectively, and what are the different methods of doing it? So what we’re going to cover today are some different ways to create your audiobooks as well as different ways of distributing them, and I’m going to mix and match a little as we get into the relevant pieces of that. But if you want to start out at a grassroots level just to have something available that you can distribute, you can always start at your own website. Most computers these days come with a basic microphone and you can download free software such as Audacity to be able to record. Your quality is not going to be great doing that. It probably will not be good enough to get accepted into any of the major marketplaces, but you can do that and have something to be able to distribute to the various people that you want listening to your product. Now, if you’re going to distribute yourself, I recommend that you upload your files somewhere other than on your own website because, first, most hosting companies don’t actually allow you to distribute the files. I mean, they probably won’t stop you, but it’s technically not allowed to do anything other than the web pages and various ancillary files and distributing audio files which tend to be very big, and can be resource hogs. If you have a lot of people downloading them at once, they use a lot of bandwidth, and you could wind up getting your hosting account canceled or just going really slow and impacting your entire website. So what you want to do is sign up for a third-party service. You could use something like Amazon S3 which is basically a way of having all of your files online and you only pay for the use. There’s a small charge for storing the files and then there’s a small charge for the bandwidth. That’s fine if you only distribute to a few people, but if you do ever get a link from a very popular website that sends a lot of traffic you way, you could wind up with a pretty hefty bill doing that. So instead, what you might want to consider, if you’re only going to have a few files is to use a service such as Dropbox and distribute it through there, or you could sign up, if you’re going to have a lot of files for a service called Libsyn, which is a very good hosting. It allows for the audio downloads and you pretty much just pay a monthly fee, and whatever your service level is, it’s how much you can upload per month. From that point on, as long as you have an account, you don’t have to pay for any of the bandwidth. So whether you have one person downloading your files or you have a 1,000 or 10,000 people downloading your files every week, it’s not going to make any more of the difference for you. You can also use the Internet Archive, which is available for free, similar to Dropbox, but it’s going to be very slow so it’s not going to be a good end user experience, but it’s something that you could use as a stop gap. It’s just something to make the files available without having to worry about impacting the performance of your own website. Now, you also have a bit of an effort for getting the distribution available. If you’re going to sell the files, then you need to have some sort of shopping cart in some way to accept payments and then get the files to the person. If you’re just going to do a podcast, then it’s a little bit easier, but you still need to set up a way of getting the podcast feed set up correctly and making it available and distributing all of that. If you don’t want to have to worry about managing the day to day of having a podcast or your MP3 files being sold on your website, you could use a service such as Podiobooks, which is a free service, and if you go to the link in the show notes, and this is Episode 5, so ModernPublishingPodcast.com/5, then that goes to a blog post on their website that talks about how to get into audiobook into a Podiobooks. They also include a pretty good set of guidelines for how to create your audiobook, and what formats to use, and that will give you some good tips for how you want to go about doing the recording and the production and learning the whole process as well as making sure you’re on a format that they would accept. Then what they’ll do is once you get approved and get published through them, they’ll actually handle all of the distribution and making sure that people are able to download the files okay without you having to deal with any of the technology side of it once the actual audiobook is produced. So that’s a good way of setting things up so that people can get it for free. I don’t believe that you can sell the audiobook version through Podiobooks. Now, if you do want to sell your audiobooks and you want to do it physically, then pretty much the majority of places such as CreateSpace and Lulu, you can actually create CDs through them and sell them like in Amazon and in the other marketplaces. I don’t necessarily recommend doing that. First, for Amazon, they actually don’t allow you to do audiobooks through CreateSpace, so you can do it digitally and you can do physical CDs, but they prefer that you stick to doing music there. If you look at the terms of service, it actually does disallow you from doing audiobooks, and I have checked with their customer service because it wasn’t worded very clearly, and they did say that they don’t allow it. Now, there are people that do it that way. It is a cheap and relatively easy way of distributing your files, but technically it’s not allowed and who knows if they’ll wind up pulling those CDs and other files offline. So I recommend that you don’t actually use that service for distributing your books. There is a service called CD Baby where you can do that, and that will also get you into those marketplaces. There is a setup fee in order to use them, but that’s one way if you want sell your physical versions of your audiobook is to do it through them. So I would probably stick to distributing your audiobooks digitally. Everybody has smartphones or iPads. I mean, there are still people who use CDs, but the market is getting smaller, and for the added expense and the added difficulty, I don’t know that it’s necessarily worth pursuing right now unless you have somebody else that is handling the publication of your audiobooks completely and they’re going to take care of it for you so you don’t have to worry about it. Now, the next service I want to talk about is going to be the Audiobook Creation Exchange which is ACX, and this is the only one that I really have experience with for selling my audiobooks, and I do recommend using them. The way that the ACX works is you go in and you sign up as a publisher, and from there, if you’re producing your own books or you’re hiring somebody to produce your books, you can upload your files and you can sell them, and then depending on whether you want to give that particular Exchange exclusive digital rights for your audiobook will determine how much of a royalty that you’ll get off of the sales that they make. Now, the other option that you can use is to hire somebody through the Audiobook Creation Exchange, and the nice thing about that is there are some people that are very professional, that do high quality work, and that will actually do all that work upfront for free for you. Now, the downside of that is that you’re then giving half of your royalties to the producer that is recording your audiobook. You are forced to lock yourself into an exclusive arrangement with ACX so you can’t use other services to distribute your audiobooks, and the way that that’s exclusive distribution works is, I believe, it’s for seven years, so it’s not forever, but you are setting a good chunk of time aside where you can’t sell your audiobook in any other marketplace if you want the higher royalty rate or if you want to have somebody else produce your audiobook for you upfront for half of the royalties down the line. They do have some bonuses, such as if your book is one of the first ones bought with some of the services when somebody signs up, then you’ll get an extra bonus in your check, and again, that would be split along with you and the producer if you don’t pay the producer upfront. Alternatively, if you do want to pay the producer upfront but find the person through ACX, then it’s very easy to say how much you’re going to spend, and depending on what marketplace you’re in and what niche you’re in and what the experience level is of the person that’s going to be recording your audiobook, you’ll probably have to pay anywhere from $200 to $400 or a little more per finished hour. That’s how they charge through ACX. Now, if you are going through them, you might think, “Well, if I’m exclusive to them, then how do I actually get my book distributed if somebody doesn’t use ACX?” And the trick there is ACX doesn’t actually sell your audiobooks directly to the end consumer. They are owned by Amazon, and what they actually do is they will distribute your audiobooks through iTunes, through Audible.com. If you produce your book professionally enough and close enough to the actual text, then Amazon will set up Whispersync for your book which means that if somebody is listening to the audiobook version of your book and they stop it and then start reading on their Kindle, it will know where they finished off in the audiobook and go directly there on the Kindle, and then vice versa if they go back to the audiobook, however much they’ve read on the Kindle will then be pushed forward for their audiobook, so it makes for a nice seamless transition between the two. So that’s one reason you want to stick very close to your actual book if you want to enable that particular feature, and I do recommend that. There are a good number of people who are buying both of the audio and the e-book versions of the books that they’re consuming. So it’s a nice thing to have there. The reason I’ve pretty much only used them is I have sold books through my websites in the past. Over the past seven or eight years I’ve sold the MP3 files for interviews and audio versions of books that I’ve done directly, but lately I am just using the ACX, and I have been doing the production for some of my books and my clients’ books directly, and I haven’t tried hiring somebody yet. That’s on my to-do list since it is time consuming to create your own audiobooks, and I’m mostly just trying to get into Amazon and Audible. In iTunes, I haven’t really seen a lot of sales through there quite yet, but that might just be because most of the audiobooks I’ve created so far have been in the running-related niches, and maybe that’s just not a good market for there. But it’s been very easy for me to use, and they have some great tutorials on the website, so even if you don’t plan on using ACX, similar to Podiobooks where you can go in and use their guidelines to learn the basics of recording. If you want to have a higher quality recording, then the help section of ACX has some great tutorials on what equipment to buy, how to record, how to edit and how to make a professional product, and if you do want to distribute through ACX, it will need to be a professional product or they’re not going to accept your book into their marketplace. So they’re probably one of the people that I would recommend. Now, if you want to outsource and have somebody else produce your books for you, there are a lot of options. I don’t want to recommend any particular one because I haven’t used any of them before, but a quick search on audiobook creation will turn up plenty of companies that are capable of creating your audiobooks, and depending on how they’re set up, they may actually distribute and sell them for you as well, or it may be they just provide the files for you and then you go to whatever services that you want to distribute them through. You can also find people on some of the sites such as like Elance or oDesk, probably Fiverr, although I wouldn’t recommend it for something like this, where you can hire somebody to just create the audio files for you. Your quality is definitely going to vary a lot more if you’re doing it that way instead of doing it through a more professional company where that’s all that they do or that is going through something like the Audiobook Creation Exchange, and there are quality controls in place where if you aren’t doing something professionally, it’s just not going to get through there, and then you’ll never get anymore work. So the best reason for having your audiobook available is that people can multitask. People have devices where they can listen while they’re working out, while they’re driving, while they’re doing dishes, and you’re going to have your voice or whoever you hire’s voice talking your message directly into your end readers, end listeners’ ears for 30 minutes, a hour, two hours at a time, and it’s very difficult to really get that same kind of relationship, even with video where they can see you and they can build up that relationship a lot faster, but they’re not going to spend as much time directly with your message as they would with audiobooks, and it’s a very powerful medium for getting whatever it is that you have to offer, whatever product that you have into the minds and into the head space of your end clients. So if you can get there, then I highly recommend having the audiobook available. It’s definitely slightly more advanced strategy if you’re just promoting your business, but it can definitely make a difference if you’re able to reach the right audience. So all of the links for the services and websites that I’ve mentioned in today’s episode are at ModernPublishingPodcast.com/5, and I will see you next week and we’ll be back to making regular episodes. This was the first podcast I listened to. Thanks for the good overview of choices. Very helpful. Thank you!